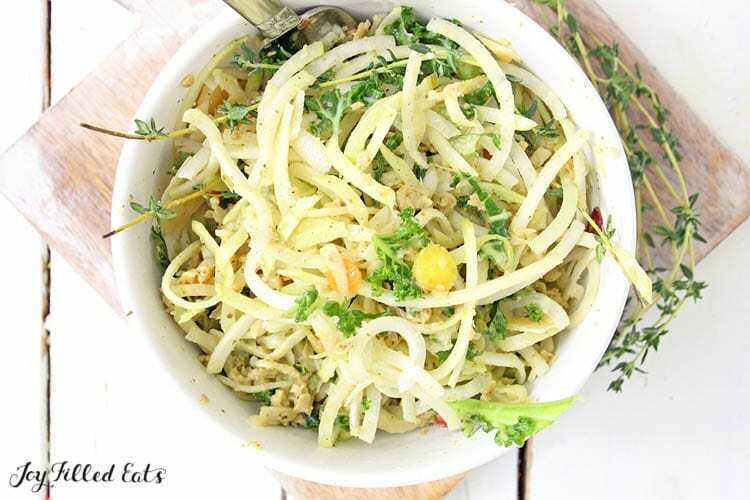 Kohlrabi salad made with kohlrabi noodles, Parmesan cheese, kale, and homemade Italian dressing is a light and refreshing side dish to pair with your favorite dinner or to enjoy for lunch. This is a great recipe and alternative to pasta salad when you’re watching your carbs or want to stay on the vegetarian side of the isles. This is really healthy, and the flavors are delicious. 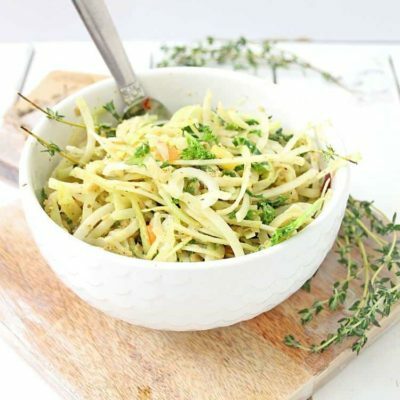 You can make this Kohlrabi Salad with little effort, and you’ll have a balanced meal that’s really good for you. I’ll never forget the first time I saw kohlrabi. I ordered a box of organic produce from a local co-op and then had fun trying to figure out what all the weird vegetables were. And then more fun trying to figure out what to do with them. It’s hard to read tone on the internet so I’ll tell you right now I am being slightly sarcastic. We tend to stick to more normal vegetables and eat a lot of broccoli, green beans, salads, and cauliflower. But it is nice to occasionally try something new. Kohlrabi was definitely new to us when that produce box showed up. 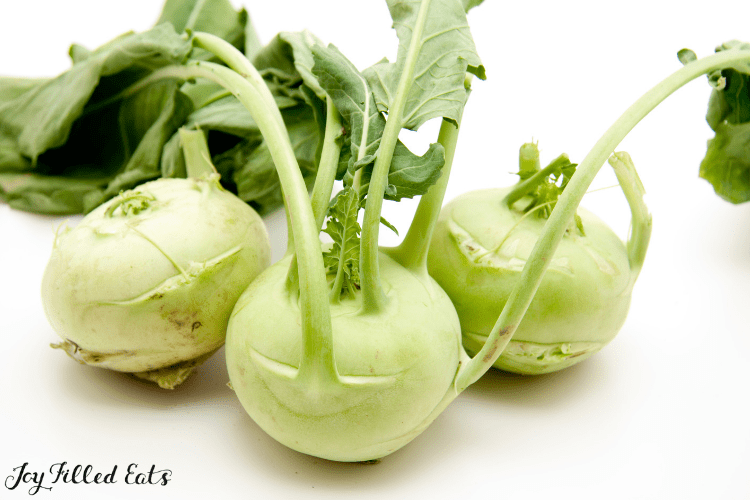 Kohlrabi is a type of cabbage that tastes like a cross between broccoli and radishes. It can be eaten either raw or cooked. Kohlrabi looks similar to fennel with a big bulb on the bottom and greens coming out the top. Like other members of the cabbage family: broccoli, Brussel sprouts, cabbage, cauliflower, etc. 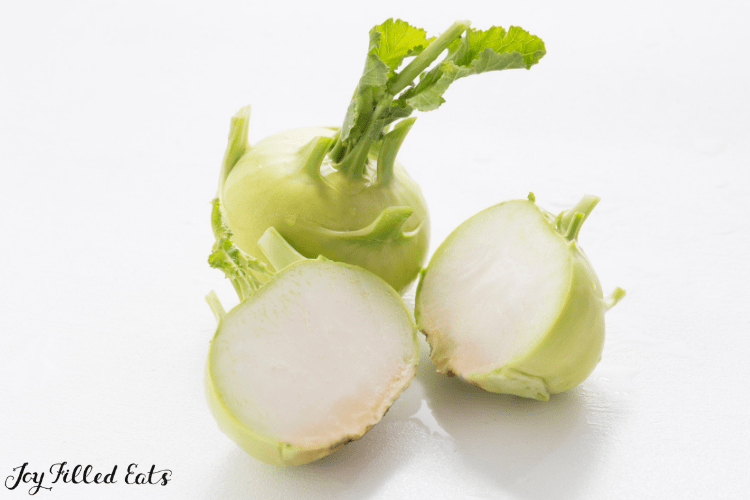 kohlrabi is naturally low carb and full of fiber. If you’ve never tried kohlrabi before I highly recommend it! It is a nice change from the usual low carb vegetables. 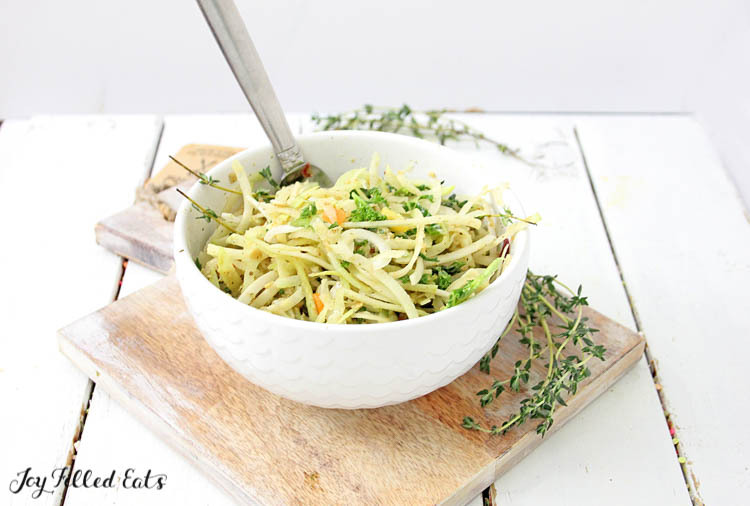 How to make Kohlrabi noodles? You can buy already spiralized kohlrabi or spiralize your own into noodles. 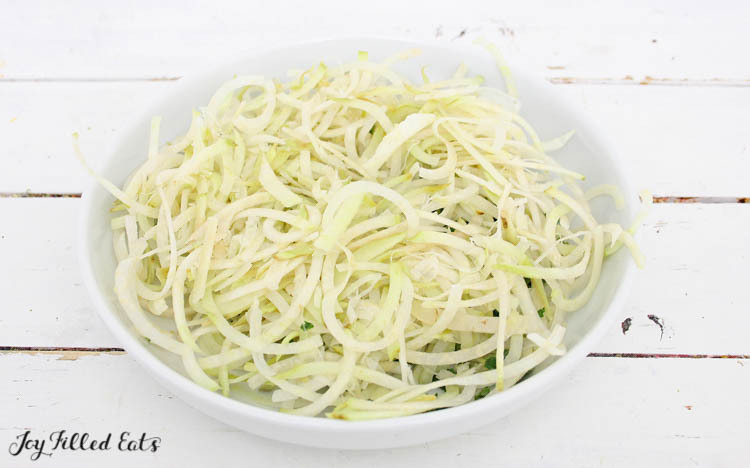 It is very easy to make kohlrabi noodles. 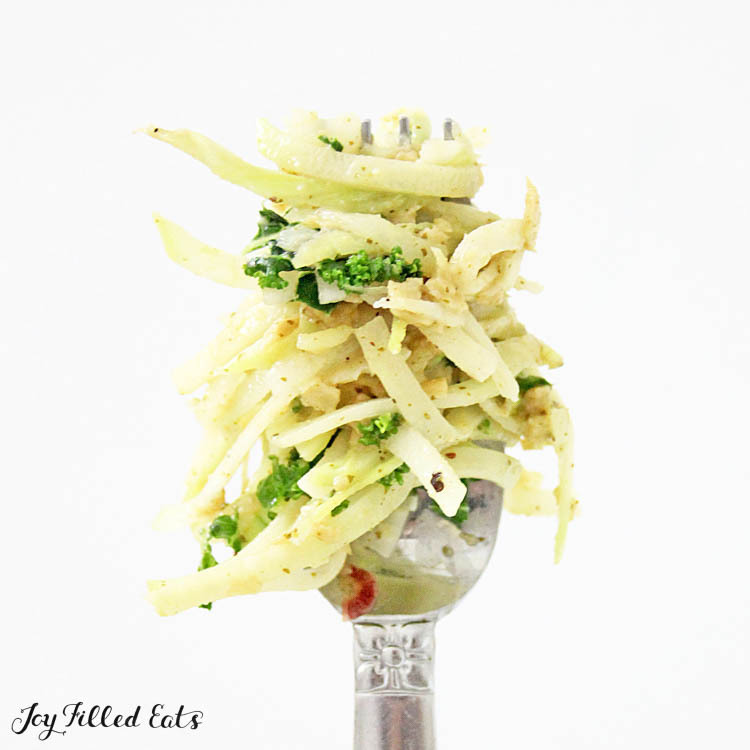 Simply cut off the top green part, peel the kohlrabi, and spiralize with your spiralizer. The kohlrabi noodles that come in a bag are generally able to be steamed in the microwave right in their own bag. If you are making your own I suggest lightly steaming them before continuing with this recipe. This makes the flavor of the kohlrabi milder. Homemade dressings are so much more flavorful and healthy than the store bought equivalents. By combining olive oil, arugula, Italian herbs, garlic, salt, and pepper you can have a delicious homemade Italian dressing in seconds. If you’d like to make this dressing to drizzle on a green salad just increase the olive oil to 1/2 cup to thin it out. If you have access to fresh herbs like oregano, basil, and parsley you can sub those in for the dried Italian seasoning in this Homemade Italian Dressing. 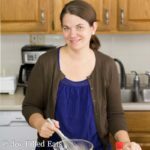 A few of my other favorite homemade dressings are Ceasar Dressing, Creamy Garlic Salad Dressing, Paleo Ranch Dressing, Lemon Dill Dressing, and Cilantro Lime Dressing. 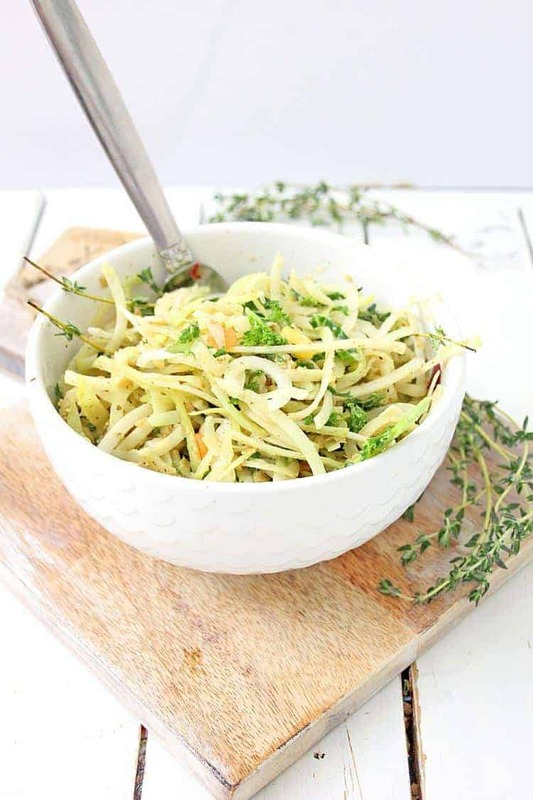 Kohlrabi salad made with kohlrabi noodles, Parmesan cheese, kale, and homemade Italian dressing is a light and refreshing side dish. Prepare the Kohlrabi noodles according to package directions. In a food processor or blender, place the arugula, olive oil, Italian seasoning, salt, pepper and garlic, and blend until all ingredients are mixed. Wash and chop the Kale, and set aside. Wash and slice the baby carrots into thin slices. Slice the parmesan cheese in long thin pieces. When noodles have been prepared, place noodles in a serving bowl, or individual bowls, top with pesto and toss in the bowl. Finish noodles by topping with sliced Parmesan cheese, carrots and Kale. Serve immediately. *** Or see instructions in the blog post about making your own kohlrabi noodles. 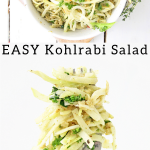 I have never tried Kohlrabi noodles before but this does looks very good.